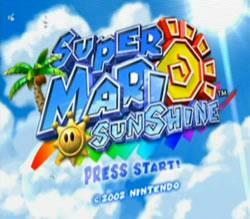 Super Mario Sunshine is a 3-D action/adventure game packed with classic Mario game play and plenty of new surprises. Developed under the watchful eye of Mario's legendary creator Shigeru Miyamoto, Super Mario Sunshine is destined to break new ground and give players a gaming experience unlike anything they've encountered before. The storyline is much different than what you might expect. This time, things are much more complicated than simply rescuing Princess Peach from Bowser. The adventure starts when Mario and Peach decide to take a well-deserved vacation to a beautiful island in a remote location. Since the island is perpetually sunny and inhabited by friendly locals, it seemed like the perfect choice at first. In typical fashion, though, poor Mario never gets a chance to relax. When he arrives on the island, he notices ugly scribble marks covering the walls throughout the community. What's worse, the person responsible for the scribbling has disguised himself to look just like Mario! Mario is falsely accused by the locals, so he decides to get to the bottom of things. Armed with a new water-pumping backpack, Mario sets out to clean up the scribbling and reveal the identity of the true villain. In this game, Mario wears a short sleeve shirt for the first time. Once the game has been completed Mario can wear a Hawaiian shirt. There was a glitch left in the game which the developers forgot to remove, there is a test level which can be accessed by using an Action Replay (cheat device). The level that can be unlocked is a mass of blocks, numbers etc and also has a strange looking blob enemy with legs. FLUDD is an acronym for FLUDD, Flash Liquidizer Ultra Dousing Device.